One car type often seen in the Southern Pacific’s transition-era “Coast Mail,” trains 71 and 72, is a postal storage car. This was a car with nothing inside but vertical stanchions, floor to ceiling, to which mail bags could be tied. Sometimes it was a working car, adjacent to the RPO (Railway Post Office car), sometimes it was a sealed car of through mail (mail in closed pouches which did not require sorting or handling by postal clerks en route). These cars could be converted from a variety of other car types, but on the SP, it was often a former RPO, with the interior “postal apartment” removed and with the mail collector arm, the exterior signature of such a car, removed. There is considerably more information about the mail handling in this kind of car, in two books published by the Southern Pacific Historical & Technical Society. One is a chapter entitled “Traffic,” in The Ghost Trains of SP’s Overland Route (Mail Trains 21-22), by Randall E. Cape and Robert G. McKeen (Pasadena, 2006); the other is the Introduction to Volume 3 of the series, Southern Pacific Passenger Cars, “Head-End Equipment” (Pasadena, 2007). The latter book even has floor plans of mail-storage cars on pages 45, 48, and 51. To model a mail storage car, one approach is to use any available SP RPO model, remove the mail catcher arm, and reletter. Those are the most visible signs of the conversion from the outside. But I wanted something a little more distinctive, such as a clerestory car. A photo I obtained from my friend Clark Bauer years ago was an image stubbornly embedded in my memory, and I decided to see if I could model the car in that photo. Here is the photo, taken at Council Bluffs in 1954. By referring to Volume 3, cited above, I learned that this was a 60-foot RPO car built in 1911, which came over to SP from the El Paso & Southwestern in 1924 (see page 392), and was immediately remodeled by SP to have bigger side doors and fewer side windows, for postal storage service. The original number, EP&SW 252, became SP 4263. There was even an interior photo of the car after conversion (from the Steve Peery collection), which shows the stanchions. Cut number 1, at far left, removes the car end you need to keep. Cut 2, next from the left, removes the excess length you don’t need; in other words, you discard the piece between Cuts 1 and 2 (this is where you can choose the exact length of the final car). Cut 3 gives you the door edge, and Cut 4 removes the excess door width. The goal here was to create two equal-width doors, and end sections outboard of the doors which were of equal length. The SP car does not have equal-length outboard ends so this may not have been a good choice for modeling SP 4263. If you wish to remedy it, move Cut 2 to the left, about five scale feet. Here are three of the cuts made, yielding three car sections: first, the car end at left, already glued to the segment between Cuts 2 and 3; second, placed above the car, is the discarded piece between Cuts 1 and 2; and third, at right, the remainder of the car. Cut 4 remains to be made. Next, I made Cut 4, the cut surfaces were filed smooth, and the final car parts all were glued together (for joints like this, I like to use a styrene cement like Plastruct’s Plastic Weld, because it really softens the plastic and permits the joint to be pressed strongly together and eliminate any minor roughness in the cuts). I then used Squadron Green putty to fill any gaps and to ensure a smooth outer surface. I also added splice plates inside, of 0.015-inch styrene sheet, to reinforce joints. That completes the basic body shell. I now added 0.012-inch brass wire handrails alongside doors and at each car corner, first shaving off the molded-on Athearn ones. I also added the Athearn brake wheel at the B end. Many SP head-end cars had lever hand brakes, but this one had a wheel (see photo at top). Finally, I have found over the years that a coat of gray primer serves well as a “witness coat” to make it easy to find defects which need more work. Here is the completed body in primer. With the primer coat applied, I can turn to the kitbash of the underbody length, which is a whole new problem, and complete a few other details. I will return to those topics, along with lettering, in a future post, Part 7B. Let me hasten to say that this conversion will not yield an exact model. There should be a side window at the B end, and the center-section windows should be equally spaced, as well as set higher on the car side. The doors are almost right, having the correct 4 foot, 10 inch width, though they have three instead of four window panes. But the model certainly captures the general look of this car, which was my goal in the first place. I have used several flats on my layout, both as photo backdrops and for industries being planned. I wrote a post about preparing for use the fine building flats sold by KingMill Enterprises; you can read that prior post at: http://modelingthesp.blogspot.com/2012/08/background-flats.html . 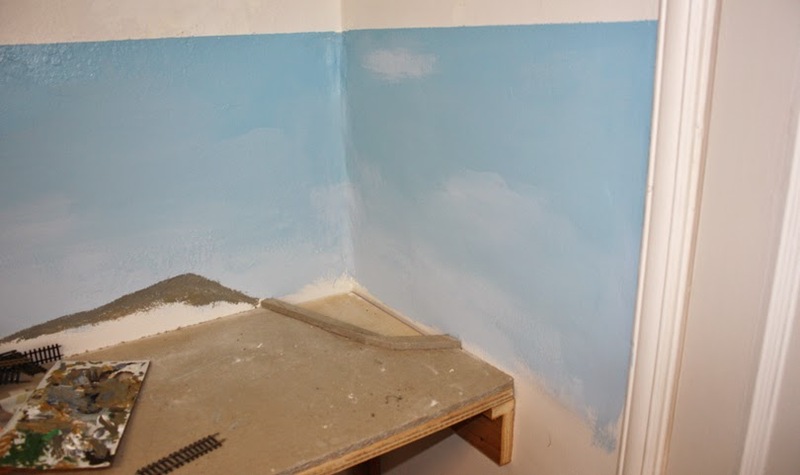 I also wrote a second post on that topic, to show how I kind of “kitbashed” one of the KingMill flats to reduce the building height to better suit my layout (see: http://modelingthesp.blogspot.com/2013/02/background-flats-2-kitbashing.html ). In this post, I want to illustrate making a building flat by taking photos of a prototype building. The structure is a poured concrete building, on 98th Avenue near the Oakland Airport, which was built shortly after World War II. 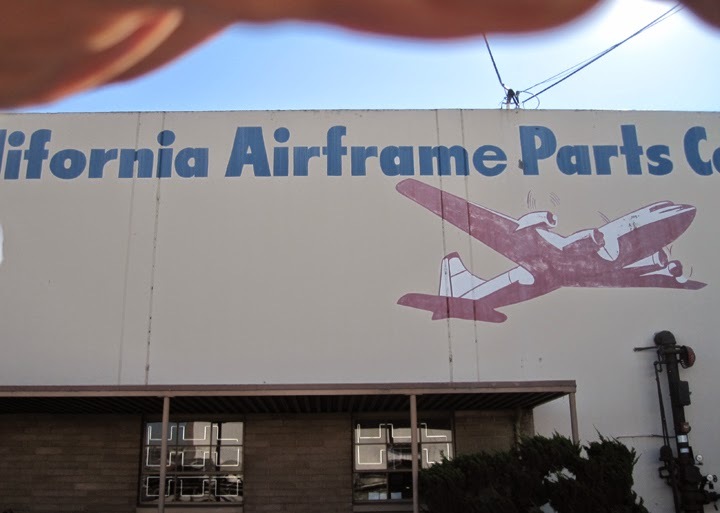 For many years, it has housed a company called “California Airframe Parts,” a company which collects and warehouses old (not to say “ancient” in some cases) airplane parts of all kinds, which of course are in demand for maintenance of older airplanes and for various kinds of restorations. It remains a thriving company today. There are Flickr photos of their old parts at: https://www.flickr.com/photos/lostamerica/sets/72057594100613805/detail/ . I decided I could include this warehouse on my layout, and accordingly took a number of photos of the building. Lighting that day wasn’t too great (the public side of the structure is north-facing), and in some photos you can see my hand trying to shade the lens. Still, I persisted in taking a series of images, because I really liked the hand-painted look of the building sign. I did manage to get a full set of images of the front of the structure. I pieced them together in Adobe Photoshop, and where the images had some “keystoning” (natural for ground-level shots where you can’t back up much), I could use the tools in Photoshop (Edit > Transform > Distort) to correct each image to a rectangle. I cropped off any sky or background visible past the sides of the building, and arrived at this. Now I could print the image on glossy cardstock. For this step, I go to my local copy shop, which has a high-resolution color printer, so the print is pretty inexpensive. 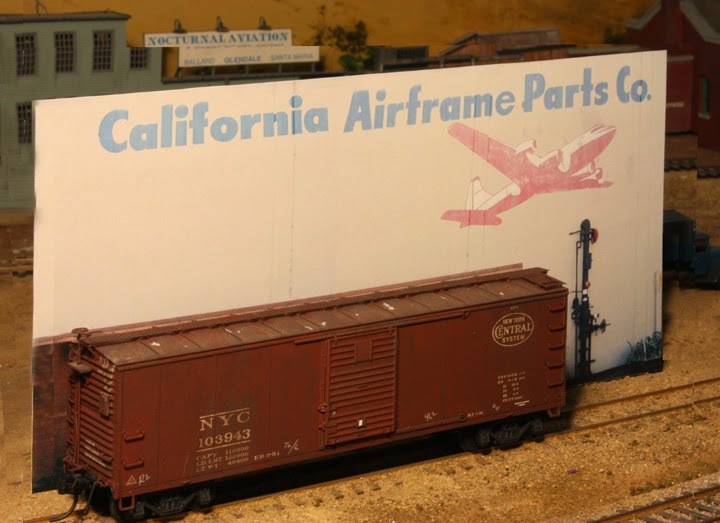 In the photo, the foreground office structure, attached to the warehouse behind it, could remain on the final flat (its windows look all right), but my plan is that it will be partly obscured on the layout by a “shipping and receiving” building for California Airframe Parts. Next I used rubber cement to attach the cut-out print to some foam core backing, both to stiffen and support the flat. Rubber cement has the advantage that it won’t affect dyes in the color print. I use it in the “contact cement” mode, as I described in a previous post about assembling building flats (see: http://modelingthesp.blogspot.com/2012/08/background-flats.html ), though with rubber cement, it isn’t really a “contact” adhesive; you can lift and reposition the glued-down object a couple of times and still get good adhesion, one of the great features of rubber cement as an adhesive. The ultimate location of this flat is along the backdrop in my town of Ballard, but here it is with a freight car (a Broadway Limited model), just to show it as a model building. Many people have used this technique, of using prototype structure photos in layouts, so there is nothing original at all about the idea. What I am emphasizing here is using a group of photos assembled into a composite, and then making a flat, rather than pasting the photo to the backdrop. In a few prior posts, you might see the depot in my town of Ballard. This is a scratchbuilt structure (more on that in a moment), which I based on the look of Southern Pacific depots, though it was intended for my freelanced short line, the Lompoc & Cuyama. The L&C occupied the trackage of what is now an SP branch line. For more on the old layout, including a track plan, see this post: http://modelingthesp.blogspot.com/2012/03/survival-from-my-old-layout.html . I set about designing the structure as a one-story depot (usual SP practice in towns where agents could rent accommodations, thus no need for living quarters to be included in the depot). There were a number of different one-story standard designs, as shown in the book Southern Pacific Standard Depots, by Henry Bender Jr., Signature Press, 2013. But when I was building my model, 25 or so years ago, I didn’t have a resource such as Henry’s book, but had to browse through photos. I now recognize that I used features of Depot No. 18, with a rectangular bay on the street side as well as a bay at track side, and otherwise followed typical SP depot floor plans. 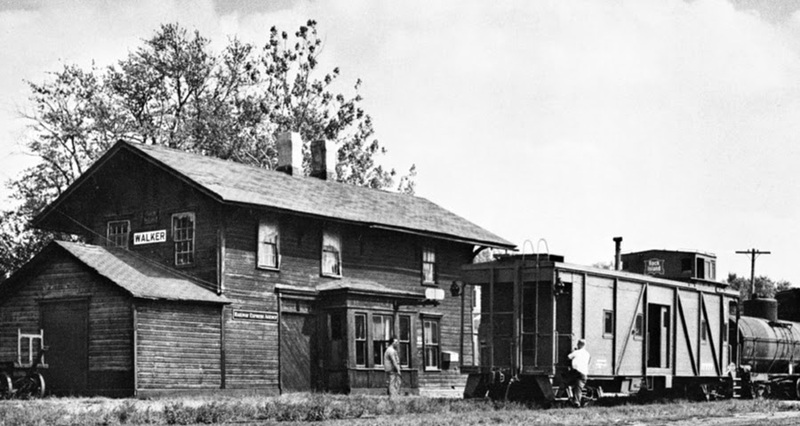 Construction of the depot used wood clapboard sheet, some Campbell windows, and a variety of Grandt Line windows and doors, not necessarily the same as the corresponding SP-style components since an accurate SP depot was not intended. Walls were well braced with 1/4-inch square balsa and heavy basswood strips, as you can see here. In the foreground is the street side of the depot. My roof was made removable, something I usually do, to facilitate later changes such as lighting or interior detail, if desired. I used heavy styrene sheet for the roof, both for strength and to avoid warping. The interior of it was braced with 1/4-inch square styrene tubing, and you can see the formers at center and each end to maintain the correct roof angle. My L&C paint scheme for structures was a pale brown body, with medium brown trim. The roof (Campbell shingles) was left natural, though weathered. You can see that paint scheme in photos from the old layout, for example at: http://modelingthesp.blogspot.com/2011/01/layout-design-ballard.html . In more recent times, as the transition grew more complete from the Lompoc & Cuyama to the SP branch, I painted the roof of this depot the SP roof color, Moss Green, using Tru-Color Paint’s item TCP-164. You can see an overhead view of the depot at this point in another of my earlier posts (here: http://modelingthesp.blogspot.com/2013/09/building-guadalupe-fruit-company.html ). Here is the track side of the depot with its green roof (I am not happy with the coverage of this repaint, and will airbrush it again). This side is not as refined in detail, because it faces away from the aisle in my layout room and is thus difficult to see. The angled bay on this side would be unusual in SP practice. One touch I added was to put the town name on a roof sign. In the original layout location, this helped with visibility. This next photo shows the way it was supported. Placing the town name on the roof of a depot is rather untypical of SP practice. But there are examples out there. Here are two. 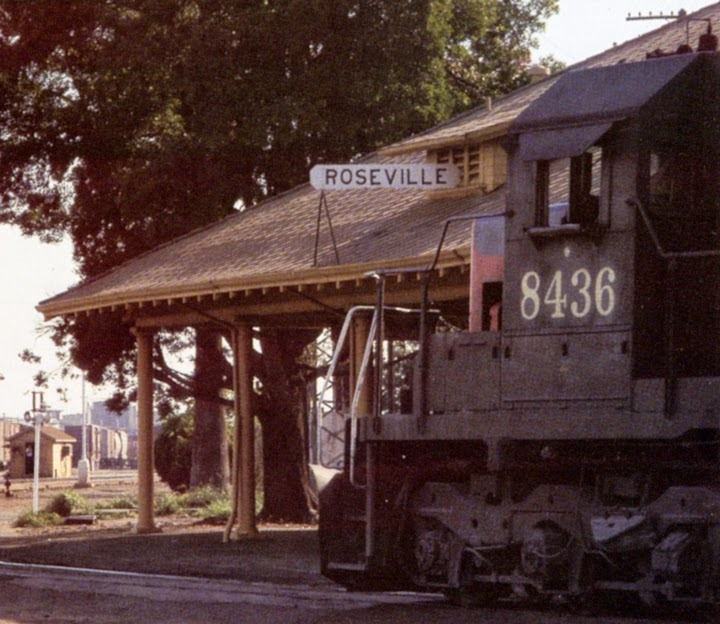 The first is the old Roseville depot (torn down about 1973), in a 1969 photo by Rick Kang. A second example is Truckee, photographed in 1958 by Fred Smith. Both these photos are from Tom Dill’s book, Southern Pacific’s Historic Overland Route (Four Ways West, La Mirada, CA, 1999); you can click to enlarge. Among other depots with such signs was Colfax. Those examples are the basis for my adding roof signs to my depot. To make my Ballard depot really have an SP family resemblance requires repainting of the building. I will have to remove the window glazing (and shades) so that I can paint all sash and mullions white, and then the body (non-trim areas) will have to be painted Colonial Yellow. Those are upcoming tasks. I continue to receive email and other comments about the waybill process, especially when I give one of my talks about the model layout use of waybills. I have presented earlier posts in this blog about waybill preparation, including the summary recently of an article by Dave Sprau (you can read that post at: http://modelingthesp.blogspot.com/2014/04/waybills-part-32-waybill-preparation.html ) and one back in 2013, quoting an eminently readable and detailed description of the process by Harry Dolan (which is at this link: http://modelingthesp.blogspot.com/2013/06/waybills-29-waybill-preparation.html ). But at least some readers (or talk listeners) seem not to grasp the point(s) even now. So I will add one more summary to the pile. This one comes from Don Douglas, who worked many years for Southern Pacific. Part of his article in an issue of The Ferroequinologist (journal of the Central Coast Chapter of the National Railway Historical Society), issue 723 for May, 2012, was used as the Afterword in the book, Southern Pacific Standard Depots, by Henry Bender Jr. (Signature Press, Wilton, CA, 2013). Here is the part of that Afterword having to do with waybill handling. “Felton, California [a one-man SP agency], located in the redwoods of the Santa Cruz Mountains, was a fun place to work. At 8:00 a.m., I would drive up to Olympia to make a check of the yard tracks at the sand quarry, then return to Felton to make a list of cars on the team track and storage tracks. Other duties including making demurrage reports and filling out various accounting reports. During mid-morning, Pacific Motor Trucking would deliver less-than-carload and Railway Express Agency shipments, and consignees would be notified. “After lunch the local from Santa Cruz arrived and was provided a switch list of cars to be pulled and spotted at Olympia and Felton. Waybills would be typed up and delivered to the conductor on the local for his return to Santa Cruz and then Watsonville Junction. This is a Philip R. Hastings photo (used with permission from the California State Railroad Museum, where the Hastings collection is located), showing the local agent at left, and the conductor re-boarding his caboose after picking up waybills and car orders from the agent. Waybill preparation and handling, along with the rest of the role of the agent, continues, I guess, to be poorly understood or even misunderstood by some modelers, judging from the questions I get after talks, or via email at other times. Hopefully this brief and clear account by Don Douglas will help. 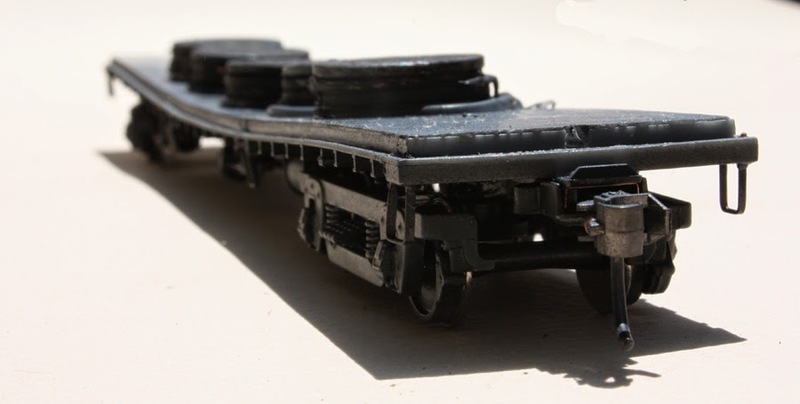 In my previous post on this topic, introducing the modeling of heavyweight sleepers (see: http://modelingthesp.blogspot.com/2014/07/modeling-sp-passenger-cars-heavyweight.html ), I talked about using the Rivarossi 12-1 model, with only some added detail and interior, for several cars of interest. At the end of that post, I mentioned that I wanted to go beyond the 12-1 (which means 12 sections, 1 compartment), and that is the subject of this post. But first, I have received some mail, essentially asking, “who or what was Rivarossi,” and the answer is that it was an Italian company, founded in 1945 by two men named, you guessed it, Rossi and Riva. For years their products were imported to the U.S. by AHM (Associated Hobby Manufacturers). In the 1990s, Rivarossi acquired a number of other European model railroad manufacturers such as Lima and Jouef, then in turn entered bankruptcy in 2004, and were acquired by England’s Hornby. The 12-1 Pullman is not in current production, but is readily found at swap meets and on eBay. 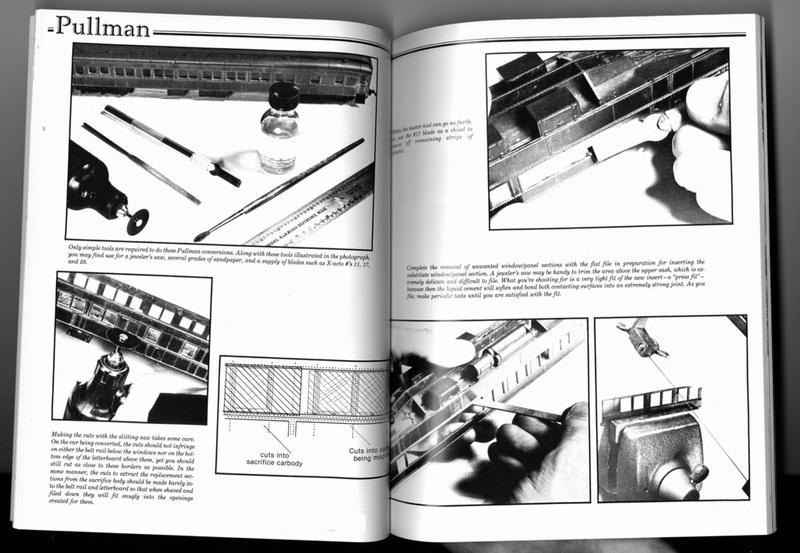 Returning to modeling of SP sleeping cars, my entire perception of this topic was formed when I read the phenomenal series of articles in Mainline Modeler magazine in 1981, by the late Thomas C. Hoff. There were five articles in the series, running in the January/February, March/April, May/June, July/August, and September/October issues in 1981, and Robert J. Zenk contributed to Part 4 and was sole author of Part 5 about underbody detailing. But Mr. Hoff’s conversion method was the core of the series. His basic idea was founded in the fact that Pullman heavyweights were built as a basic car body of fixed length and width, and within it were built various “modules” to serve a variety of sleeping car needs. The only really visible external sign of these internal variations was the window arrangement. So Hoff realized that if you rearranged windows of a model, without otherwise modifying the car body, you could achieve a whole range of sleeping cars. The obvious starting point? the Rivarossi 12-1. Here is a page spread from Part 2 of the series, showing some of the process of doing this job. You can see, left page, lower left photo, cutting out the window or windows from a sacrifice body, then cutting out a destination for those windows in the “good” body, right page, top, and filing the opening to fit, right page, bottom left. My own work removing windows just used an X-acto knife instead of the slitting saw. This is all pretty easy because the Rivarossi car body plastic is rather soft, and the real challenge is to avoid removing too much material. This particular car body was fortuitously convenient, because the window section was a pale cream color, making the removed parts easy to see on a new body. 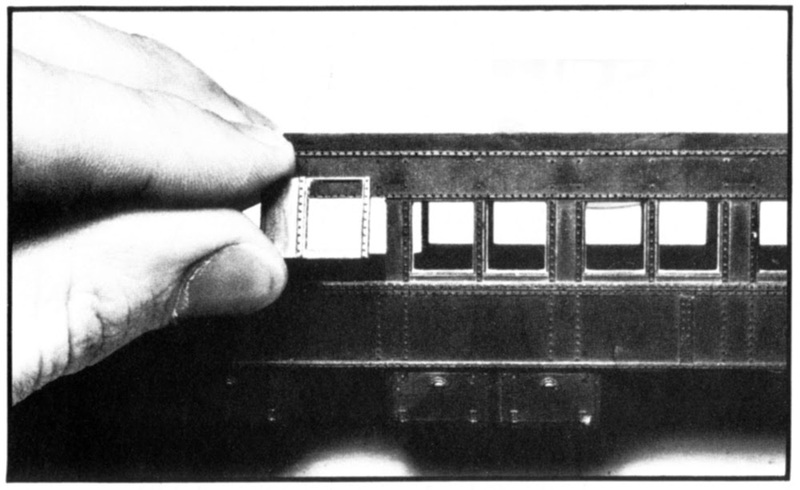 Here is a conversion to a 10-1-1 car in progress (that is, 10 sections, 1 drawing room, 1 compartment), showing both sides. You can click to enlarge. On the second side (lower photo), it is a window pair that has been inserted, but the far side of the car is visible through the left-hand window of the pair, making it look like a solid panel and not a window. These changes simply follow Hoff’s description in his article. Incidentally, the entire Hoff series was reprinted in the “Best of Mainline Modeler” book, Passenger Cars, Volume 1 (Phoenix Publishing 1991), in case you cannot find the magazine issues. It won’t fit into this post, but I will show in a future post the additional steps I took for completion of that car body you see above. I should mention at this point that New England Rail Service now sells separate windows of all the Pullman sizes and styles, so you no longer need a sacrifice body. They also sell a well-designed air conditioning duct that can be cut to the desired length for the car being modeled. For descriptions of all their parts, and photographs of many of them, you may visit their site at: http://www.newenglandrail.net/products.htm ; all are designed to work with the Rivarossi body. The NERS parts are also sold through Walthers and thus can be ordered direct, or through your local hobby shop, as you prefer. The original Rivarossi cars came with undersize wheels in their trucks, about 29 or 30 scale inches in diameter, and had oversize flanges. A standard 33-inch freight wheelset will fit fine and operate better. Passenger cars typically had 36-inch wheels, but wheelsets this size don’t fit well in the Rivarossi sideframes, and also create a coupler height problem. I have usually used Kadee 33-inch wheelsets in my cars. To conclude, I show one of the cars I completed using the Hoff method, an 8-1-2 from the Pullman list, name chosen as Rock Pass (8-1-2 means 8 sections, 1 drawing room, 2 compartments). This model has a number of relocated or replaced windows, and has had air-conditioning ducts added. Although the prototype Rock Pass actually had been assigned to SP service once it was air conditioned in the 1930s, it returned to the Pullman pool in 1942. I chose to depict the car as still carrying the Pullman name, as though it remained in pool service, though there is one indication it was sold to the Wabash some time after 1948. You can count the four paired window sets, just left of car center, where the four sections are located. Incidentally, the Rivarossi interior molding has also been kitbashed to suit the revised interior arrangement. In a future post or two, I will say a few more things about modeling SP heavyweight Pullmans and other sleepers. I have posted several short comments about SP passenger cars (introduced at: http://modelingthesp.blogspot.com/2012/10/choosing-model-sp-passenger-cars.html ), with recent ones concentrating on head-end cars. But other passenger cars can also be important, especially one of my own favorite types, the sleeping car. On the Coast Route, SP ran two heavyweight night trains for many years, the Lark and the Coaster. The former was the premium service, while the latter was the economy train. The Lark, inaugurated in 1910, was from the beginning a deluxe, business-travel-oriented train. It became completely streamlined in March, 1941. The Coaster, a daytime train early in the 20th century, became an overnight train in 1926, and was so operated until its cancellation in October 1949. This means that in my modeling year of 1953, there was no regularly scheduled Coast Route train using heavyweight sleepers. To operate them on my layout, then, would require one of three scenarios: first, that I declare a modest time warp, and operate the Coaster anyway; second, that I take advantage of many photos showing deadheaded heavyweight sleepers on the rear of the “Coast Mail,” likely moving to and from the Pullman shop at Richmond, California; or three, that a Special Train be operated, such as a convention or other group movement, which could have a wide range of consists. My preference is numbers two and three. Those familiar with SP passenger train history will know there is one other scenario possible. The train which replaced the Coaster in 1949 was the Starlight, largely composed of streamlined Daylight articulated chair cars, plus a coffee shop and tavern, but with a few heavyweight sleepers on the rear end, and at least one baggage car, as late as 1954. This is a possibility if I should have enough Daylight equipment on hand. Where does this kind of information come from? I have put a lot of miles on my two volumes on Southern Pacific Passenger Trains, from Dennis Ryan and Joe Shine, especially Volume 1, “Night Trains of the Coast Route” (Four Ways West, La Mirada, 1986). Of especial value, train consists for various dates are included. Back in the 1980s, when I started to put together some heavyweight sleepers, the best available model in HO scale was the Rivarossi (later AHM) car. It models a 12-1, that is, a 12-section, 1-drawing room car, by far the most common single floor plan in the Pullman fleet (about half of Pullman’s 9000 cars were 12-1 cars), and thus a good choice by Rivarossi. 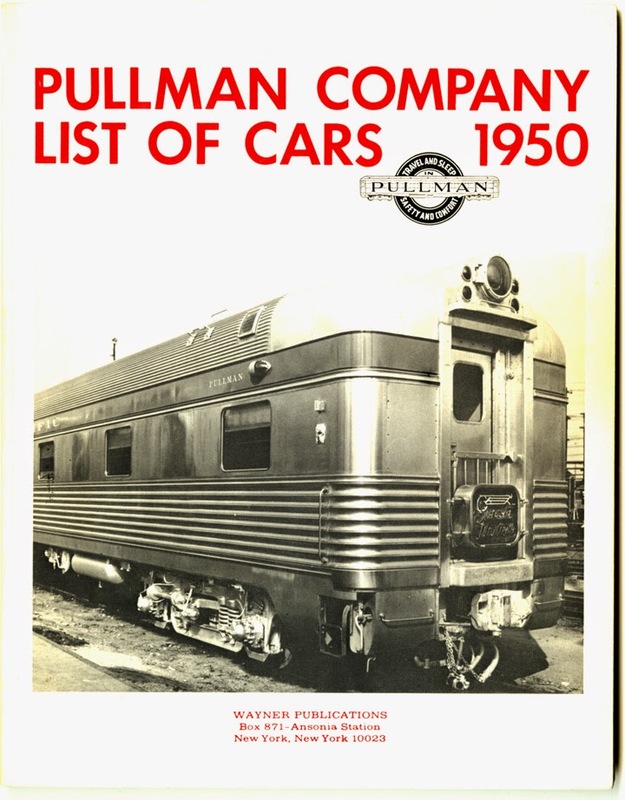 In those days, long before the SPH&TS had published its magisterial volumes on the SP passenger car fleet, one relied on one of Bob Wayner’s books, a reproduction of the Pullman Company List of Cars, 1950. Here you can look up car names (or numbers) and find out what kind of car it was, and to whom it was sold in the breakup of the Pullman fleet in 1948. But as I say, in reality the great majority of these cars had air conditioning, meaning pretty darn visible rooftop ducts. (Air conditioning dates for SP cars are available in the SPH&TS series, Southern Pacific Passenger Cars, Volume 2 on sleeping cars.) I made these ducts the hard way, starting with wood shapes from Walthers, then working many, many layers of modeling putty to get the contours to blend smoothly. That makes my model of Inyo a bit more realistic than Tuolumne. This model shows the common arrangement, in which ducts did not extend over restrooms or aisleways. Next I wanted to do one of these cars in Two-Tone Gray, though in 1953 that was not yet a standard scheme for pool cars. It was certainly in use on relief cars for particular trains, which is how I chose to regard Serra (at that time having no source of information of the dates of paint schemes on individual cars; see the SPH&TS series). The only modeling complication is that white lettering is needed. My last 12-1 model was to capture the fact that sometimes cars from the Northwest railroads with which SP connected in Portland, NP and GN, traveled beyond their normal southward limit, the Bay Area, and reached Los Angeles. They would then return northward. I chose to model a GN Pullman with the name Columbia Glacier. This is not an actual Pullman name, but is similar to the names of a number of Great Northern Pullmans, for example Harrison Glacier, Grinnell Glacier, Blackfoot Glacier, and Sexton Glacier. (Those cars were a series of duplex-bedroom cars.) 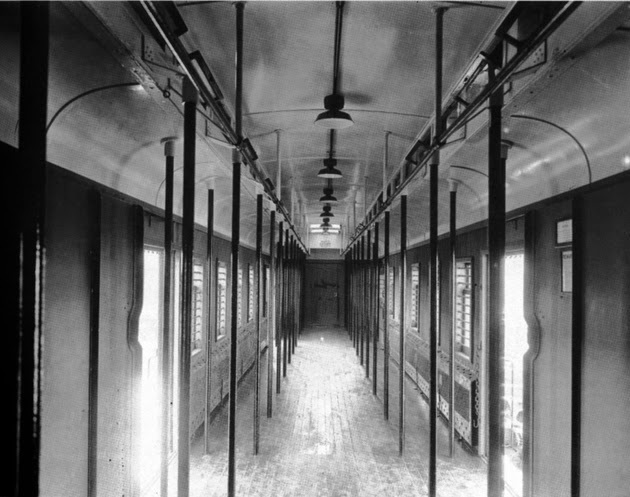 The Pullman Company did have a “Columbia” series of 10-section observation cars, but not a Columbia Glacier in that series. Given that there is a real Columbia Glacier in the North Cascades of Washington State, and it is part of the headwaters of the Skykomish River there, it seemed like a good choice of name for a GN car. But I really wanted to go farther than the 12-1. Yes, the SP owned and operated a fair number of 12-1 sleepers, but SP really seems to have preferred other types, usually cars with more room accommodations, such as the 10-1-2 (10 sections, 1 drawing room, 2 compartments), the second-most numerous floor plan after 12-1, and I wanted to see if I could model some of them, too. That will be the subject of the following post. 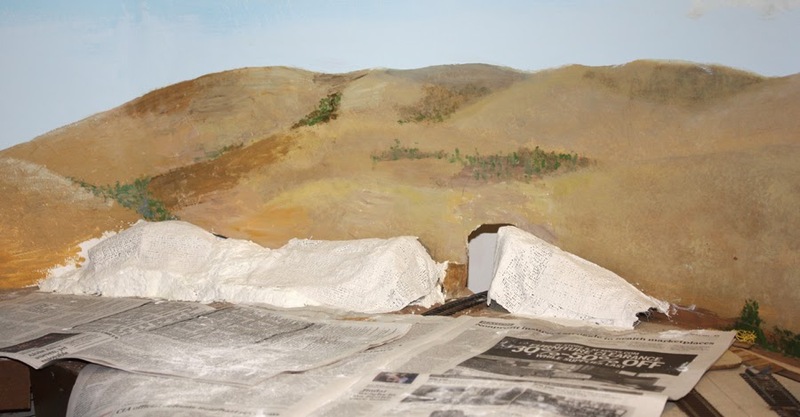 In my previous post about the town of Santa Rosalia, located at the end of my mythical Southern Pacific branch line, I described how far I have gotten to date with painting the backdrop for this section (you can read that post at: http://modelingthesp.blogspot.com/2014/01/constructing-santa-rosalia-backdrop_29.html ). I envision Santa Rosalia located at the mouth of the Santa Maria River, just at the Pacific Ocean shore; see my earlier post at: http://modelingthesp.blogspot.com/2011/01/layout-design-locale.html . With that location, Santa Rosalia can have a modest waterfront, and should be able to serve as a home port for fishing boats. [I will discuss the Central California fishery and its boats in a future post.] Before I went to the next step and began arranging track for this part of the layout, then, I needed to identify where I would place a waterfront scene. This post takes up that subject. As is probably evident from photos of this part of the layout, I really don’t have enough space to model very much seafront or piers of any size, so I decided to settle for a modest wharf. Anyone setting out to do this ought to look over John Pryke’s fine article in the September 1997 issue of Model Railroader, pages 60–65, as he presents a number of nicely worked-out details you can add. Pryke did another nice article on waterfronts in the Model Railroader issue for February 2010, or see the series in Model Railroader from last year, on their “Rice Harbor” layout, especially the March 2013 issue with an article on building the harbor. My main difference with these articles is in the method of making water, about which, more in a moment. I decided that a seawall would be an adequate way of depicting the shoreline near my future fish cannery. As it happens, Frenchman River Model Works makes a nice set of cast resin parts (part no. 1573) which are rows of pilings, one way to make a seawall. I reasoned that if I added details like bollards or bitts or cleats along the edge, I could tie up a model boat to this seawall. And Frenchman River offers detail parts of all those mooring devices, so I ordered a selection of them. 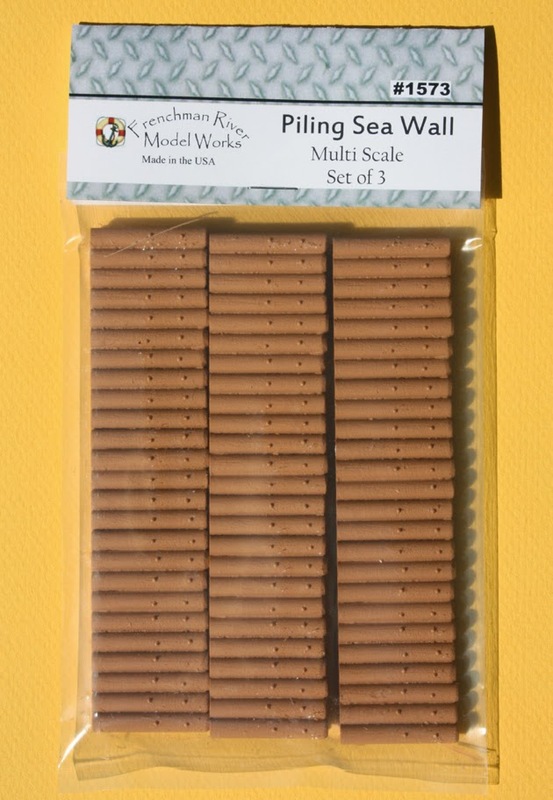 Here is how the Frenchman River seawall parts look in the package. Each of the three sections is five inches long and about 1-1/8–inch high, a little taller than fits my situation, but if need be they can be cut down. The molded brown color is too light and too brown for realistic pilings, but this is easily changed, and is an excellent base color. I approximated the size of the area I wanted to model as water, and cut the Homasote in that area accordingly. This is in the back corner of the Santa Rosalia extension structure. I only sought to have enough water to include a tied-up fishing boat [I will return to the boat in a later post], so this is not an extensive marine scene. I also added a raised walkway along the edge of the seawall, as is often seen. This photo shows the corner where the water will be (the exposed plywood, at this stage). It is the far corner of Santa Rosalia, visible in the second photo of the post cited ate the top of this post. At this stage, the walkway is just Homasote strips. The next step was to prepare the area for the water coating. I like to make a small-radius cove along the edges where the backdrop meets the horizontal surface, so that the corner is not obvious. My usual method of making model water does not use clear casting resin. Aside from the complications and mess of placing the resin, I have noticed on the layouts of others, that over time that the resin surface becomes dull and cannot really be cleaned. I long ago decided to represent water some other way. In my ocean beach scene, I painted the color of the water, then used gloss medium as a top coat, which dries clear and nicely glossy (you can read about it at this link: http://modelingthesp.blogspot.com/2013/11/rebuilding-my-ocean-beach.html ). Not only does it seem to clean well with a damp sponge, it can readily be re-coated with more gloss medium if needed. I’ve been very happy with my ocean water in that beach scene, and will use the same method here at Santa Rosalia. In the previous post about the Shumala extension, I described the beginnings of a low ridge of hills that lies along one end of the extension (that post is at: http://modelingthesp.blogspot.com/2014/04/the-shumala-extension-part-6-basic.html ). 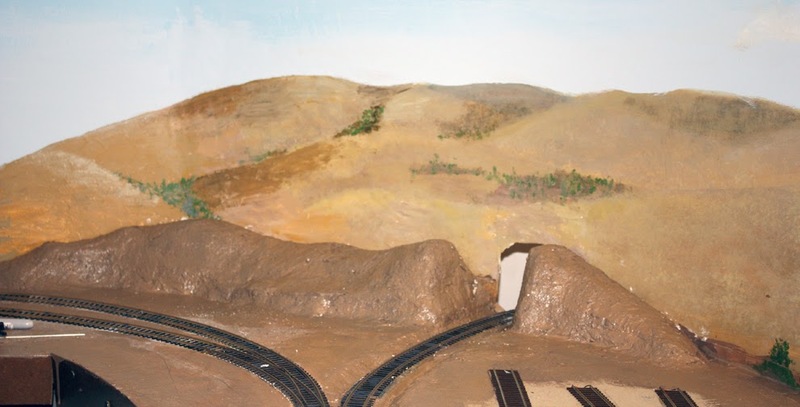 These hills are partly to blend the transition from the backdrop onto the layout, but also to help conceal the backdrop hole though which the SP main line runs. This contour was much better than what I had before, mostly in rising higher near the railroad cut, but still did not have convincing contours (to my eye), nor did it extend far enough to the left of the scene. I added a few more chunks of styrofoam at the left end of the ridge, and blended the contour with more Sculptamold, while at the same time working to refine the contours around the cut, especially the left bank, which did not seem to rise enough to match the contour of the right bank of the cut. I will skip showing each iteration after each batch of Sculptamold, but here is how it looked when I thought it was approaching a satisfactory overall contour. When I mixed the two colors, I found out why the Nutmeg had come out so dark—it had not been sufficiently mixed the first time. The pigments do take a lot of mixing for all of them to entirely emerge and contribute to the total color. But I went ahead with the half and half mix and re-did the hill. Comparing to the above photo, you can see that the color is now better. I mention all this not for any great intrinsic value of my repainting, but because to me it illustrates a vital principal, in scenery construction or in many other modeling tasks. If something doesn’t look right, don’t be exasperated and let it lie; change it. One little something “not quite right” can keep you from enjoying an entire project, or worse, can get you stalled on it, until you realize what has to be corrected. Next I proceeded with my usual dirt and grass color applications, using Woodland Scenics turf materials. I described my approach in a prior post, which is at: http://modelingthesp.blogspot.com/2013/12/repairing-ballard-hill-part-5.html . That post also lists the various specific Woodland Scenics materials that I like to use for my Central California scenery. As always, I used the Dave Frary approach, first applying a “base texture” with ground foam, followed by a “finish layer” to refine coloration, and to add shrubs and clumps of foliage. Using a folded piece of card, with scenic material in the folded “vee,” I gently blew real dirt onto the walls of the cut, freshly coated with matte medium. With the roundhouse back in place, and the small warehouse in its location at left, this is how the refined hillside looked. The coloration of the various ground foam areas is, of course, chosen to blend with the backdrop painting colors. The backdrop opening for the track is gray in this view. My final step (once foreground scenicking is done) will be to add a tree or two near the hillside at right. The purpose of the tree(s) near the cut is to obscure further the view of the hole in the backdrop, so placement will be done with that in mind. Where to start. Richard Hendrickson died from a heart attack on June 28. He was 83. He was one of my closest friends, in the hobby or elsewhere, and was so for more than 25 years. His loss is a real blow to me. But I want to collect here some thoughts and memories of him and his contributions. 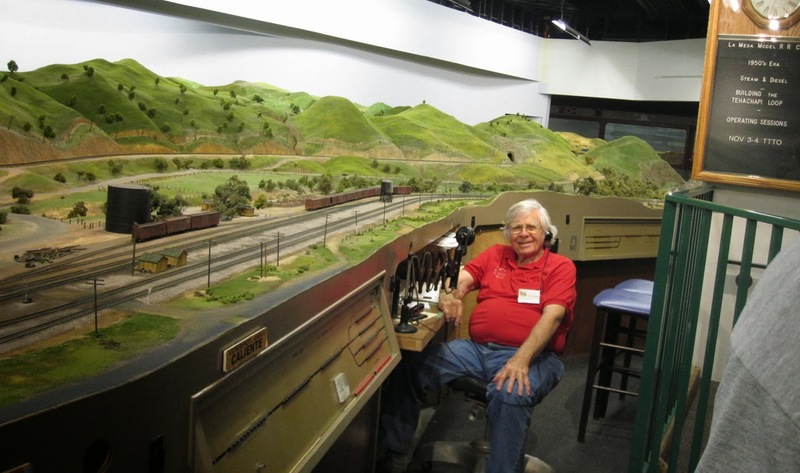 Many model railroaders came to know Richard because he was unfailingly generous with his time and information, and loved sharing with anyone who was interested. He had an immense amount of information, so this sharing had an impact on many, many modelers. I am just one of them. There’s an old saying, “When anyone dies, a library of knowledge dies with them,” and of course that applies to Richard; and his library was bigger than most. But he was also someone who freely and happily shared his abundant knowledge whenever he could. 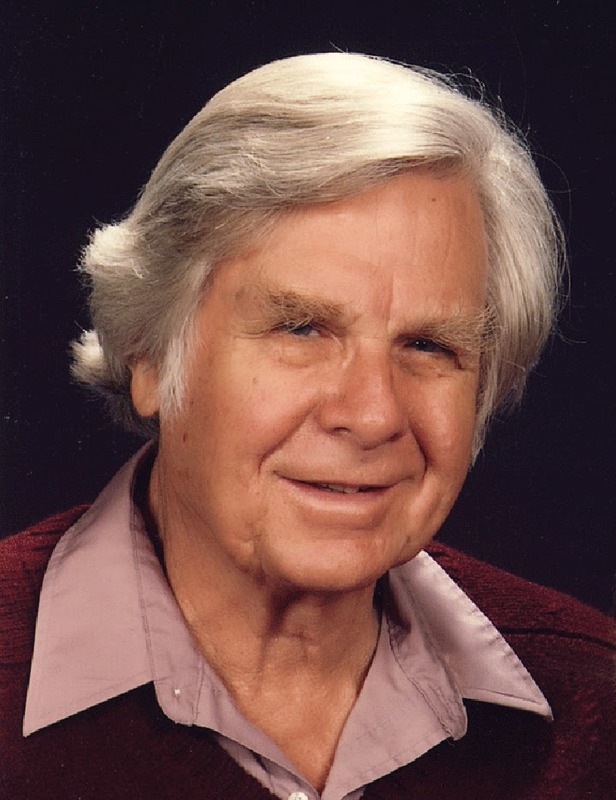 He published more than 400 magazine articles on model railroading, authored or co-authored four books about Santa Fe freight cars, along with the book, Billboard Refrigerator Cars, co-authored with Ed Kaminski. Below is the author photo he submitted for that book. He always advocated sharing information, and he had few peers in the extent to which he did so. We first met by telephone, when I called him in the middle 1980s about one of his articles in the old Prototype Modeler magazine. We hit it off immediately on the phone, and the next time I had a consulting trip to California (I lived in Pittsburgh at the time), I visited him at his house, in Penn Grove. Getting together in person just increased our sense of having a great deal in common, and we were close ever since. He was a central part of the large get-together of freight car modelers I helped organize at the NMRA National Convention in Pittsburgh in 1990, and thereafter he and I conducted get-togethers of the highly informal “Friends of the Freight Car” modelers’ group. Richard had led a remarkable life. In his youth, he raced sports cars, and held a competition license for a few years, so it was no surprise that he always drove peppy cars. He also worked as a racing mechanic in both the U.S. and Europe. He was an experienced backpacker, loved to ski, and rarely found a ski run that he couldn’t readily master; he could ski circles around most people on the hill, and continued to ski until recently. He raced small sailboats (especially International 14s) for a number of years, and loved to tell stories of those days, such as the exhilaration of completing the upwind course leg westward in San Francisco Bay to the Golden Gate Bridge, turning eastward and setting a spinnaker, and feeling the boat leap under you as it accelerated away downwind. He earned a Ph.D. from the University of Connecticut in linguistics, and had a career as a professor of English, first at San Diego State University, and then at Sonoma State, from which he retired in 1995. After retirement, he and his wife Sandra built a new house in Ashland, Oregon, and moved there from Cotati, California. He soon discovered that his great enthusiasm for and knowledge of wines could flourish with Oregon and Washington wines, as it had in northern California. And few were his equal in enjoying a great meal with a fine wine. He had always been interested in airplanes and knew a great deal about them, and as retirement approached in the 1990s, he arranged to take flying lessons. Then, after a few years renting airplanes, he bought a Citabria and loved to fly it. He and I made a number of memorable trips in that and other planes, including one to the Portola Railroad Museum. Soon after moving to Ashland, he obtained the rent of a hangar at the Ashland airport for the Citabria, and later was appointed to Ashland’s Airport Commission. Our real connection was model railroading, and he was an unfailing source of information. I never ceased to marvel at his memory for detail. I know the Southern Pacific and PFE well, and he was a Santa Fe modeler, but he knew the rolling stock of many railroads as well as I knew the SP or PFE. He had collected more than 30,000 photographs, primarily of freight cars, and it was most impressive to see all the three-ring binders of prints on his shelves. 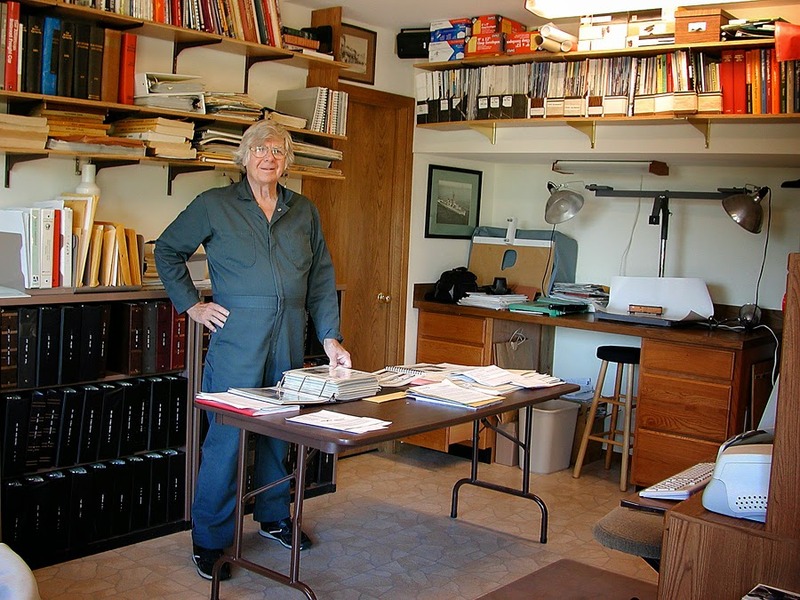 Here is a photo of Richard in his office in Ashland, taken by John Signor in 2006. At lower left and behind him are a few of the photo binders. At right is his photo copy stand, with railroad books on the upper shelves all around the room. The black and white photo on the wall near the copy stand is the destroyer on which he served during the Korean War. In the late 1980s he and Sandra started a company called WestRail, to offer essentially kitbashing projects based on Athearn “Blue Box” cars, such as replacing ends or doors, etc. For example, one of them made it possible to model a Santa Fe War Emergency box car, using superb resin castings of new sides from a master by Lloyd Keyser. As more and more accurate resin kits came along, together with accurate brass freight cars, WestRail became an anachronism, and none too soon for Richard and Sandra, who had already tired of the endless, finicky work of keeping all the detail parts in stock, and picking all the parts to fill kit boxes. But the company was a pioneer in showing the way to more accurate freight car modeling. 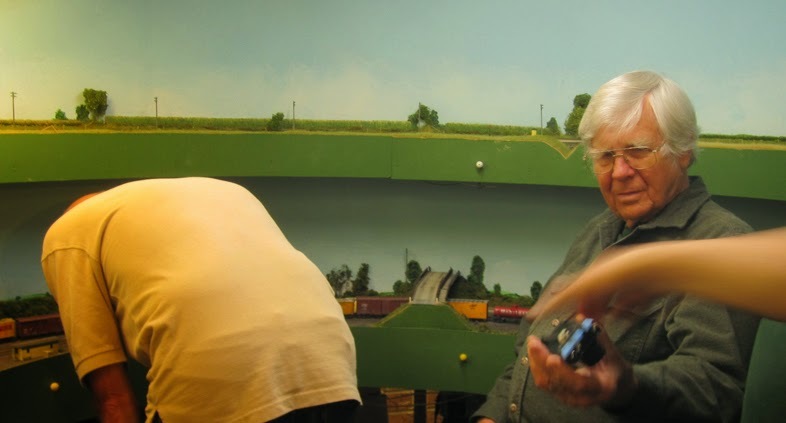 Another of his favorite places to operate was at Bill Darnaby’s layout in the Chicago area, annually visited when he and I would go the the RPM meet at Naperville. In the fall of 2013, this photo shows him at Bill’s East Yard, with Kadee’s Sam Clarke at right, handing him a throttle. As a teenager, Richard not only grew up around steam locomotives, but had some memorable experiences actually operating Santa Fe steam in the Oceanside area. He retained quite a soft spot for steam, and often enjoyed seeing restored steam power running in various places. 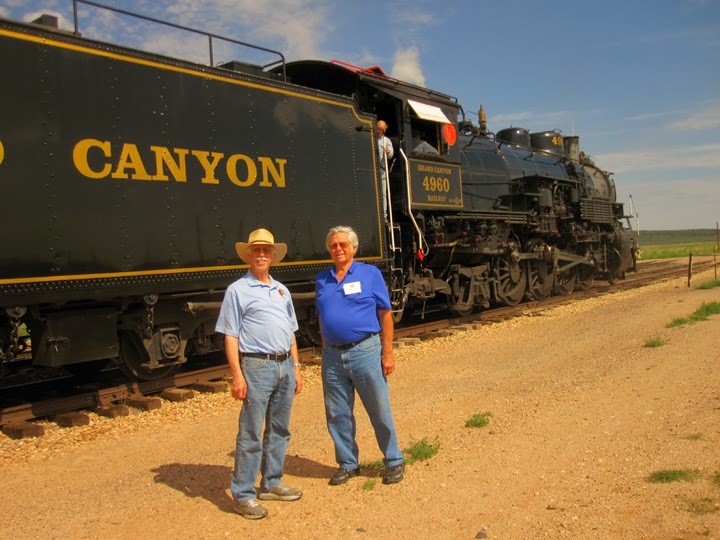 In August of 2013, he and I and our wives attended the Santa Fe Railway Historical & Modeling Society convention in Flagstaff, Arizona, and of course went on the convention’s excursion to the Grand Canyon behind this 2-8-2, a former Burlington locomotive. Here are the two of us by the engine, during a photo run-by, in a photo taken by my wife. One more example of someplace Richard always looked forward to going, is the annual modelers’ meeting organized by Mike Brock in Cocoa Beach, Florida. 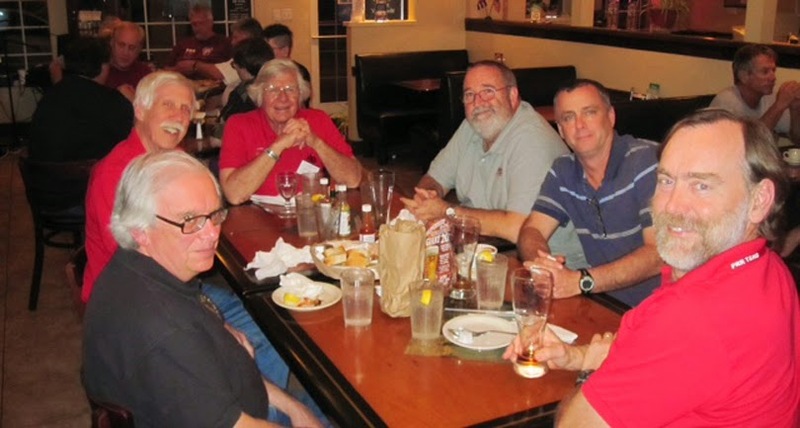 One of our traditional activities there has been to go to an excellent Cuban restaurant called Roberto’s, and this photo, supplied by Dave Hussey, shows a dinner group there in 2012 (three of us wearing red “Friends of the Freight Car” shirts). At near left is Larry Kline, then me, Richard, Dave Hussey, Lindsay Raley, and Bruce Smith at right. Larry, who passed away just this March, was another long-time modeling friend, so this photo does tend to choke me up a little. From the first time I knew him, Richard consistently had one theme about modeling: the only way to get more accurate models to be manufactured, and for modelers to care about such models, is to get information out there about the prototype, by publication, presenting talks, or privately. Richard did that tirelessly and often urged me to do more of the same. Looking back, one can only think he was exactly right. Today there is far more good information available, and many more modelers are informed enough to try and model accordingly. We all owe him a great debt, but no one more than me. The earlier posts on this topic can be found by using the search box at upper right; the earliest three were linked from Part 4, which can be found at: http://modelingthesp.blogspot.com/2014/06/modeling-sp-passenger-cars-part-4.html . In my second post of the series, I mentioned the fine kits for SP head-end cars from Southern Car & Foundry. I have had two of them on my workbench, kit 1002 for a 70-foot baggage with windows, and kit 1003 for a 60-foot baggage. I had Dennis Williams build one of each, and paint them for me. Nearly all my head-end cars are painted in the standard Dark Olive Green scheme. This was discontinued as standard in 1954, but since I model 1953, it is necessarily my standard scheme. A few SP heavyweight head-end cars were painted in other schemes, such as Daylight or Union Pacific Yellow, for relief service in the relevant trains, including a few in Two-Tone Gray. But before 1954, the Two-Tone Gray was not generally used for cars in pool service. For more on this, refer to the SPH&TS book, SP Painting and Lettering Guide (for passenger equipment), and to Volume 3 on head-end cars, in the series Southern Pacific Passenger Cars (SPH&TS). In my third post in this series, I mentioned what was then my choice for painting Dark Olive Green, the Star brand color STR-29 from P-B-L (you can read that post at: http://modelingthesp.blogspot.com/2012/11/modeling-sp-passenger-cars-coast-mail.html ). I still regard STR-29 as an excellent choice. But there is now also a Tru-Color Paint option, their color TCP-135, SP Dark Olive Green, which airbrushes beautifully. Dennis painted my cars with the Tru-Color paint. In my second post of the series, see the link to Part 4, at top, I mentioned the arrangement of lettering for most SP round-roof (sometimes called “Harriman”) baggage cars. The B end of the car can be identified in some classes by an external handbrake lever, but always by the end toward which the brake cylinder “points” (that is, indicated by the pointed end of the cylinder). That is the end of the car which, on both sides, carries the legend “BAGGAGE,” while the other end, on both sides, says “RAILWAY EXPRESS AGENCY.” Also, when facing the car end from between the rails at the B end, the car side to your right is called the the right side. On most SP baggage cars, that right side was the location for the single battery box (if the car had one). For this lettering, there is a truly excellent decal set out there, from Thin Film Decals, their set HO-160, “SP Heavyweight and Harriman Dulux Gold Lettering.” This set was shown in my third post of this series, which is at: http://modelingthesp.blogspot.com/2012/11/modeling-sp-passenger-cars-coast-mail.html . The film truly is thin, and the gold color excellent over a Dark Olive Green color. Here is the 60-foot car, SC&F kit 1003, painted and lightly weathered. The body here is removable, so glazing can be added, and glazing could also be replaced someday if necessary. I should emphasize that I believe the car did not leave Mr. Williams’ shop this way, and the curve developed gradually. When I first noticed it, it was slight, but slowly got worse. After some cogitation, I added stiffening beams in the form of rectangular brass tubing, 5/16 x 5/32 inches, to span from bolster to bolster. I drilled and tapped the approximate center of the edge of each beam for 2-56, then drilled a clearance hole for 2-56 in the matching location on the underframe. Putting a screw through the floor into each beam and drawing it down tight fixed the problem rather cleanly. Here is the modified floor and underbody section (you can click on the image to enlarge it). I think if the car weights were not placed in the center of the car, but were at the ends or around the truck screws, this problem would not occur. This said, I am delighted with the excellent detail of the Southern Car & Foundry body, and am pleased to be able to add this car to my Coast Mail train.